Miiverse in Super Smash Bros. for Wii U. This article is about the stage in Super Smash Bros. for Wii U. For the social network, see Miiverse (social network). Miiverse is a stage in Super Smash Bros. for Wii U. It was revealed during the Super Smash Bros. for Wii U: 50-Fact Extravaganza on October 23rd, 2014, and added to the game in version 1.0.8 on June 14th, 2015. It featured a unique stage element: user-created Miiverse posts drawn in support of a particular fighter would appear in the background. Due to the discontinuation of the Miiverse service, these posts no longer appear as of November 8, 2017. Its layout is similar to Battlefield, though it is slightly wider, the platforms are longer, and the ceiling is slightly higher, giving it the highest ceiling among SSB4's legal stage list. Selected messages created by users appeared in the background, intended to cheer the fighters on. Users were able to post drawings for each character in dedicated Miiverse communities, which would then appear when that character participated in a match. The post's border color corresponded to the slot of the character the post was cheering for. During the results screen, players had the option to send a post directly to Miiverse community for to the character who won the match. This prompt occurred even if Miiverse was disabled on the system, but would not appear if playing with amiibo, seemingly due to the inability to suspend the game while amiibo are in use. This stage is not available when playing against others online, making it the only stage with that restriction. When playing locally, this stage can be played even with the Wii U not connected to the Internet. Doing so will cause no messages to appear; this was the case even when the service was active. When a Smash Ball appeared, one message for each fighter popped up. When a character acquired one, numerous posts for that character quickly popped up and stayed that way until the character lost the Smash Ball or their Final Smash ended. When the crowd was about to cheer for a fighter, up to four messages appeared for that fighter. Ordinarily, a larger message would pop up cheering on a character who has attained a KO, but sometimes a message for the KO'd character would show up instead. If the KO is done via meteor smash, one message for each character would appear, and the KO'd character's message would shake. When completing Dragoon or Daybreak, two messages appeared for the character who assembled the item. The Miiverse social network was discontinued as of November 8, 2017; after that date, this stage no longer has posts displayed in the background, and users are not able to post new drawings to its communities. The Ω form removes the thin platforms and resembles a smaller version of the Online Practice Stage. In addition, the length of the stage increases slightly to match that of Final Destination. While the service was active, Miiverse posts would still appear in the background as long as players were connected to Nintendo Network. An example of a community page on Miiverse before it shut down. Miiverse's appearance is based on its namesake's interface: they both feature a white and green color scheme, as well as a gray checkered background. Miiverse is either considered legal as a purely cosmetic Battlefield alternative or banned due to its redundancy as a semi-clone of said stage. If the Wii U is not offline, the posts in the background can be distracting for players and may contain inappropriate material. However, with Miiverse now closed, no posts will appear in the background, helping its case for legality. Miiverse is the only downloadable stage that is completely unavailable in 8-Player Smash. Miiverse and Pirate Ship are the only downloadable stages not available on Super Smash Bros. for Nintendo 3DS. Any snapshots and replays that were taken on this stage could not be shared, even before Miiverse was shut down, nor could snapshots taken there be painted on. If a Nintendo 3DS is being used as a controller, the stage will be unavailable. Replays would record where and when posts appeared but did not record post content. Therefore, until Miiverse was shut down, it was possible to see different posts every time a replay was watched. 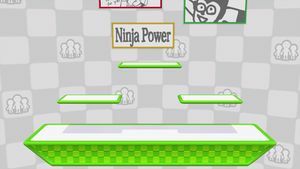 Miiverse is the only stage from the Wii U version to not appear in the Special Orders mode. Miiverse is one of five stages from Super Smash Bros for Wii U not to return in Ultimate, the others being Pyrosphere, Woolly World, Jungle Hijinxs and Orbital Gate Assault. Miiverse is also the only downloadable stage in SSB4 (including returning stages) to not return in Super Smash Bros. Ultimate. It is most likely because of the service's discontinuation would render the stage's gimmick ineffective, despite it being purely aesthetic, as well as the Switch not having Miiverse on it. This page was last edited on April 17, 2019, at 02:48.